It is replaced by the Symbol LS 4278. The LS 4074 scanner from Symbol Technologies offers cableless scanning operation for greater flexibility, mobility and user friendliness. Ergonomically designed with the operator in mind, the LS 4074 also provides excellent scanning performance superior to competitive corded scanners. 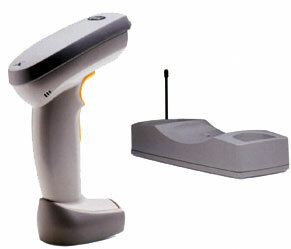 Plus, it's a member of Symbol's LS 4000 family of high-performance scanners. Also available with Reduced Space Symbology (RSS). 916 MHz. RSS Includes RL474 base, USB cable & AC adapter. 916 MHz. RSS Includes RL474 base, PS/2 Y-cables & AC adapter. 916 MHz. RSS Includes RL474 base, XT-AT Synapse, no adapter cable, no power supply. See accessories. 916 MHz. RSS Includes RL474 base, RS-232 9 pin female TxD on 2 & AC adapter. 916 MHz. Includes RL474 base, PS/2 Y-cables & AC adapter. 916 MHz. RSS Includes RL474 base, XT-AT Synapse Adapter Cable & AC adapter. 916 MHz. RSS Includes RL474 base, Synapse Adapter Cable & AC adapter. 916 MHz. Includes RL474 base, RS-232 9 pin female TxD on 2 & AC adapter. 916 MHz. RSS For IBM 46xx. Includes RL474 base, Port 9 direct connect cable, no power supply. See accessories. 916 MHz. RSS Includes RL474 base, RS-232 25-pin female cable & AC adapter. 916 MHz. RSS Includes RL474 base, direct connect cable, no power supply. See accessories.